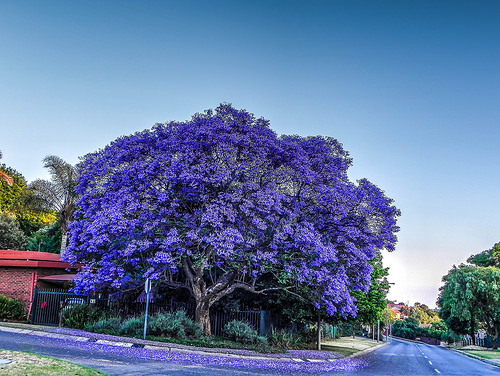 Jacaranda is a genus of 49 species of flowering plants in the family Bignoniaceae, native to tropical and subtropical regions of Central America, South America, Cuba, Hispaniola , Jamaica and the Bahamas. It has been planted widely in Asia, especially in Nepal. It has been introduced to most tropical and subtropical regions. The genus name is also used as the common name. The name is believed to be of Guarani origin, meaning fragrant. The word jacaranda was described in A supplement to Mr. Chambers’s Cyclopædia, 1st ed., (1753) as "a name given by some authors to the tree the wood of which is the log-wood, used in dyeing and in medicine" and as being of Tupi-Guarani origin, by way of Portuguese. Although not consistent with the Guarani source, one common pronunciation of the name in English is given by /?d?æk? ?rænd?/.